The special counsel investigation into alleged collusion between the Trump campaign and Russia is unlikely to offer Democrats an October surprise, a new report suggests. Special counsel Robert Mueller will soon wrap up his report on whether there was collusion between US President Donald Trump's team and Russia and whether Trump himself obstructed justice during the course of the investigation, an anonymous official told Bloomberg. However, that won't happen until after the November 6 midterm elections, and the report may not be made public at all. Mueller will present his findings to US Deputy Attorney General Rod Rosenstein, who is effectively the special counsel's boss since the number one at the department, Attorney General Jeff Sessions, recused himself from the investigation. Rosenstein will have some say over what information is given to Congress and what is disclosed to the public. 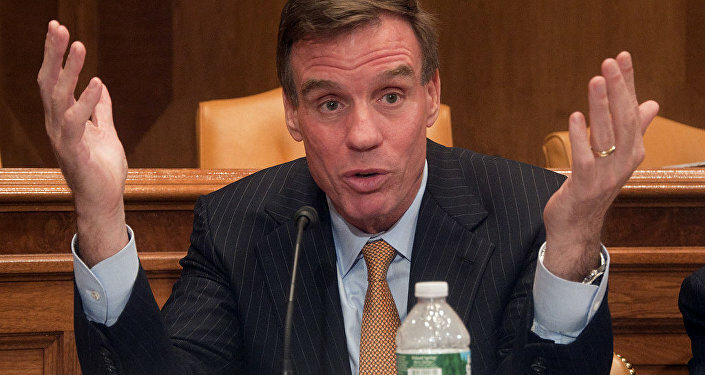 Back in June, Sputnik News reported that US Senator Mark Warner (D-VA), vice chair of the Senate Intelligence Committee, was promising "wild stuff" ahead of the midterm elections. "If you think you've seen wild stuff so far, buckle up. It's going to be a wild couple of months," the senator said. However, nothing "wild" has yet materialized, and Department of Justice guidelines warn prosecutors about making big moves before elections. Another US official told Bloomberg that nonetheless, Rosenstein has expressed to Mueller his desire to have the investigation wrap up as soon as possible. Rosenstein's wish for a speedy conclusion, in addition to the DOJ rules, suggests that there will be big news from Mueller's team in the "days and weeks" after the midterms, Bloomberg theorizes. The outlet goes on to note that Mueller took over the Russia probe "almost a year and a half ago," and in that time, "Mueller has secured more than two dozen indictments or guilty pleas." A surface reading of that paragraph might give the impression that Mueller has been remarkably successful with his probe, but Bloomberg omits several pieces of information that cast the investigation in a less rosy light. While Mueller did take over the Russia probe almost a year and a half ago — in May 2017 — that probe had already been running for 10 months at that time, and it was spearheaded by disgraced FBI agent Peter Strzok, who later privately conceded he didn't think there was a "big there there" when it came to Russia and Trump. Mueller took over the probe with the mandate of investigating "any links and/or coordination between the Russian government and individuals associated with the campaign of President Donald Trump" and, critically, "any matters that arose or may arise directly from the investigation." Eight have so far pleaded guilty to charges from Mueller. Twenty-six more have merely been indicted. So far, none of Mueller's "two dozen indictments or guilty pleas" have fallen under the primary purpose of the probe, Trump-Russia collusion, but have instead resulted from Mueller looking into the other "matters." While many of the people closest to Trump have fallen, including the man who was briefly his campaign manager, his longtime lawyer and some of his campaign advisers, they've been hit for fraud — often fraud which occurred before the race — for failing to register as foreign agents of countries other than Russia, or for lying to the FBI about things that weren't illegal in the first place. Mueller has also indicted a number Russian nationals whom he accuses of meddling in the election, but nothing in Mueller's indictments indicates any collusion or "links and/or coordination." Bloomberg's grouping of those indicted and those who have pleaded guilty into one total is outright misleading. But Bloomberg is also far from the only news outlet to use that standard of measurement in assessing the effectiveness of the probe. Indictments can be secured in two ways: before a grand jury, or before a judge. So far Mueller has used quite a few grand juries. To convince a grand jury to indict someone — meaning allow the government to formally file criminal charges against them — a prosecutor needs to establish what's called "probable cause." Probable cause is commonly defined as "a reasonable amount of suspicion, supported by circumstances sufficiently strong to justify a prudent and cautious person's belief that certain facts are probably true." According to an old American legal adage, a good prosecutor could convince a grand jury to "indict a ham sandwich." That's because establishing probable cause requires a far inferior evidentiary standard than actually convicting someone of a crime, which requires that the prosecutor prove their guilt "beyond a reasonable doubt." In short, grouping indictments in with guilty pleas (when a person admits to crimes) or convictions obscures that the Fifth, Sixth and Fourteenth Amendments to the US Constitution demand that those accused of crimes be considered innocent until proven guilty. To use a metaphor, it gives the impression that Mueller went fishing and caught 34 fish, when in reality he caught eight fish of a species he wasn't hunting for (since nobody has admitted to collusion) and an additional 26 things that could wind up being nothing more than soggy ham sandwiches. In any case, American citizens are eager for Mueller to show them what he's got. Two-thirds of US citizens, with a majority amongst both members of the Democratic Party and the Republican Party, wanted Mueller to finish his investigation before the midterm elections, according to a poll CNN/SSRS conducted in August. Perhaps the probe will conclude before Thanksgiving, providing Americans with plenty of fodder for the traditionally politically contentious holiday. And maybe after that's all over, American politicians can get back to talking turkey.